New studies explore social context of natural disasters. April 9, 2012. The journal Environment and History has recently published a special issue devoted to historic floods in medieval and early modern Europe. In an editorial introduction, historian James Galloway explains that studies examining environmental disasters have multiplied since the 1980s in the kind of history that seeks connections between the human and non-human worlds. Increasingly, natural disasters are not perceived as unavoidable transgressions on society – “acts of God” - but, instead, as a product of a particular society. Natural catastrophes are, in fact, “social phenomena” located at the intersection of a society’s unique pattern of vulnerability and resilience in its relationship with the nonhuman world. The papers in the latest issue of Environment and History reconstruct past natural disasters, consider the interactions between them and past societies, and measure the relevance of such research in an era particularly prone to environmental catastrophe. Historical climatologist Christian Rohr begins the issue with an innovative paper that explores tangled relationships between floods and urban economies on the upper Danube between the fourteenth and seventeenth centuries. Using an impressive variety of documentary evidence, Rohr reveals that medieval and early modern city communities understood the perpetual risk of flooding. In fact, many within these communities actually benefitted from it: carpenters, for example, gained a sizeable share of their annual income from the repair of flood damage. These economic relationships, and the adaptation of houses in vulnerable areas, contributed to the creation of what Rohr calls a “culture of flood management” that endured into the nineteenth century. The other papers in the issue tackle coasts and reclaimed wetlands along the North Sea region, home to some of the most sophisticated societies in Europe between the medieval era and industrialization. These “early modern” societies left a wealth of documentary evidence, enabling, for instance, geographer Adriaan de Kraker’s reconstruction of North Sea storm frequency and intensity. Galloway’s own paper considers the complex interactions between devastating late medieval floods and the demographic and economic decline of contemporary English society. Many environmental historians who have examined natural disasters or (often related) climatic fluctuation have created “declensionist” narratives, in which things keep getting worse as natural conditions deteriorate. Recently, however, many scholars have started to admit that the past often defies the assumptions that inform declensionism, sometimes in unexpected ways. Sure enough, while Galloway paints a picture of decline he does demonstrate that while industries like milling or peat harvesting suffered from repeated flooding, estuarine fisheries thrived. Finally, Tim Soens completes the issue by applying Amartya Sen’s “entitlement” principle to flood protection along the North Sea coast. 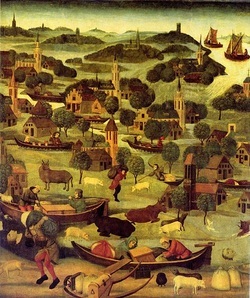 Late medieval floods were especially devastation not only because of their intensity, but because changes in social relations changes the distribution of resources that increasingly hampered flood protection. Soens explores how entitlements once destined to defend against floods were rerouted to fund wars just before some of the worst flooding disasters of the late medieval and early modern periods. Ultimately, the interdisciplinary articles within the latest issue of Environment and History are most significant for the way in which they build upon existing principles of environmental history, using the insights of the humanities to reconceptualise past natural disasters. To prepare for a warmer planet, we must understand not only the various “forcing,” human and natural, that contributes to climate change, but also all that social structures that shape how new patterns of weather will be experienced.